Atomos Ninja Blade comes with an inch-perfect simple design that makes it an easy-to-use model extremely reliable to its functionality. It comes with a silky smooth, 5.1" Super-Atom IPS, a capacitive touch screen that responds in lightning speeds to gestures. This Ninja Blade is a smart option for production recording, monitoring and playing back deck and comes combined with a wide array of devices that gives it that extra touch as a tool. These include capture cards, playback deck, external monitor and a cut edit suite for editing of recordings. The Atomos Ninja Blade has been developed for use in different conditions with its tough and robust design and lightweight, making it easy for use in tight conditions. The Atomos Ninja Blade is constructed using aluminum used for aircraft, and this makes it a light and portable design as well as durable. Each removable part has a lock mechanism which enhances the sturdiness of the recorder. Weighing at just 380grams, the Ninja Blade is the perfect option for shootings at home, on top of a mountain or in a studio. Thousands of hours have been invested in the design, development and testing of every aspect of this recorder. Everything about the camera is Atomos brand from standard IP cores and HDMI/SDI interfaces. This ensures that the Ninja Blade delivers in every aspect as defined. The Atom OS5 used in the Atomos Ninja Blade is as smart and robust as the hardware itself. Important control features are a touch away enhancing the operation of the camera. Common video production functionalities such as playback, monitoring, cut and tag editing are easily accessible, and the OS5 gives flexibility regarding operational enhancements. Users can record directly from the Sensor using your lens irrespective of its type or age. The Ninja Blade supports different types of lenses, and this makes it an economical solution as it will be applicable with future lenses that will breathe new life into it. The OS allows for the addition of common functions with traditional dedicated devices such as signal testing and monitoring. 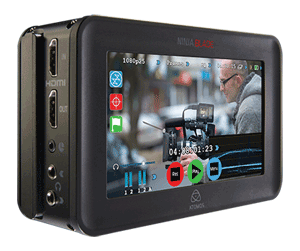 The Atomos Ninja Blade unbelievably just 6 watts of power and this makes it five times more power effective than its closest ranking competitor. The model also comes with four different power options including NP series battery, AC mains power, Continuous Power dual battery system and a DC power adapter which is used for large batteries. This makes the Ninja Blade a great companion for field operations. You can also use this model to record up to 60 hours continuously using Avid 36 on a 1TB HDD. For high-quality bit-rate such as Avid DNxHD and Apple ProRes formats, with a 500GB drive, you can achieve a continuous recording of up to 5 hours. The OS5 used is intuitively designed to swap recording easily and conveniently. You can use, eject and even change drives including on Atomos brands from a recorder or edit suite and play it via any monitor for reviewing. For smooth production using external devices, it is important for recorders to have synchronized capturing time-code and triggering record. The AtomOS Ninja Blade model gives users accurate time-code and starts/stop triggers when used with other leading camera brands such as Sony, Canon, Nikon, Red, JVC and Panasonic. In the event of a catastrophic event, the OS5 is developed to detect broken files within two frames and reconstruct them for immediate recovery. This ensures that you do not lose important moments from your recording. The camera comes with two channels of digital and audio record channels, a line out and headphone jack to ensure that your audio needs are well taken care of the Ninja Blade makes sure that you never lose sync, or your audio does not drift through frame-locking all audio including analog and digital. Atomos Ninja Blade works right out of the box, you can be using it within minutes! We supply everything (except storage media).